With one sentence, my son broke my heart. Our rabbit passed away in the morning about a week ago. Two weeks of sickness took its toll. He grew weak and thin even though we gave him food and water by a syringe. After the first week, Shadow rarely moved. On the last day, he would fall over, unable to get back up. We had an emergency appointment with the vet scheduled for that afternoon, because the treatment was not helping. I hurried home for lunch when I could break free from briefings and meetings. I didn’t even cancel the vet appointment–not because I didn’t believe my wife and son’s ability to figure out that Shadow had passed, but because I didn’t want to accept it yet. 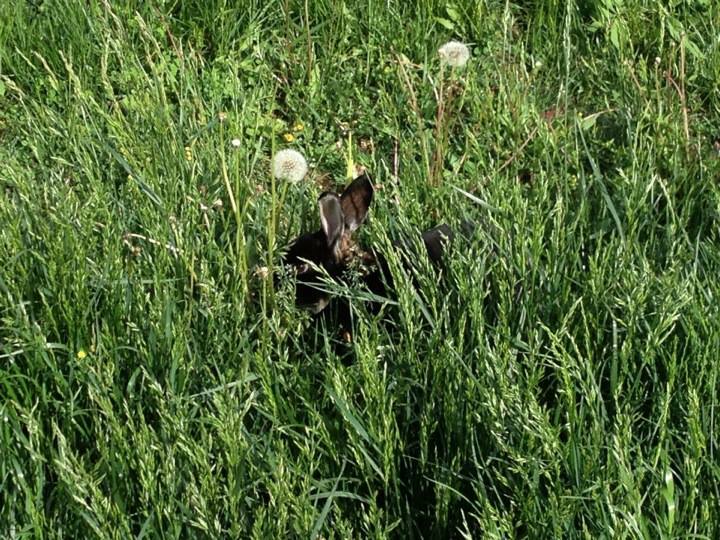 I spent ten or fifteen minutes digging a deep hole in the long grass that was Shadow’s favorite place to hide when he would hop around the fenced yard. 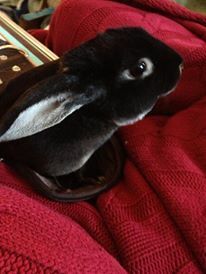 Rather than simply grieve the loss, we remembered with joy the fun moments we shared with the rabbit. Once, Jonathan forgot Shadow in the yard. I hurried outside hoping he hadn’t squeezed through a gap in the fence, but Shadow was nowhere to be seen… until two black ears popped up within a thick patch of grass. Maybe it was time to mow! Shadow would jump sometimes and thump the ground, changing direction in mid-air. When we first got him and took him out in the yard, it took Jonathan and his friend a good half an hour to finally catch Shadow and put him back in his pen. It touched my heart to hear Jonathan laugh in spite of tears. We also took comfort that Shadow no longer suffered. Watching him wither away was painful. Jonathan and I both spent hours trying to care for Shadow as he grew ill. The vet gave us something like baby cereal for rabbits, and it would clump up in the syringe we used to feed Shadow. Squeezing hard enough to get the food out without putting pressure on our weak bunny’s face was a difficult challenge. We held a sort of vigil for two weeks, hoping our efforts helped. But Shadow still passed away. I thought about how Jonathan must be feeling, and I thought of King David in the Bible. Quick recap: David sinned, sleeping with Bathsheba and getting her pregnant. Once that happened, David tried to trick her husband into thinking it was his child. When that failed, David coordinated for the husband to be killed in battle. God sent Nathan to call David out for the sin, and David repented. But Nathan also promised that the child of that union would die as a result of the sin. The child grew ill. David fasted, forsaking food and drink. He lay on the floor, inquiring of God on behalf of the son. His servants tried to pick him up, tried to give him food… and he rejected their offers. This lasted a week. The servants grew worried. If David took the sickness hard, how would he take this news? So this became our song, out there in the lawn. As we laid Shadow in the grave, I started to sing Blessed Be Your Name. I cannot imagine the sorrow and suffering of a parent who loses a child, or of a spouse losing their other half. There’s a reason the best advice is to simply be there with them in their grief, to listen, to say nothing. Even with our relatively insignificant loss, it was still very difficult to sing the second verse. But being a worship leader is more than singing on stage for the congregation, convincing people to clap or raise their voices to a popular tune. It’s demonstrating worship, even for our little congregation of the two of us, responding to God no matter the situation. Sometimes leading worship means showing others how to worship when it hurts. A friend of mine recently started a blog, The Face Without. Given our frequently differing views, it didn’t take long for him to get my attention. His post concerned the idea of paradise in the afterlife and how that influences the believer’s worldview. Short version: If there is an afterlife that is eternal and better than this life, then true believers desire to get there more than they care about this life. This life is finite. Heaven is eternal. Point, afterlife. Therefore, how long we live here doesn’t matter. No reason to try to extend life or worry about staying safe, no reason to fear death, no motivation to cure disease. This life is painful, full of suffering. Heaven is ideal, free from suffering. Afterlife two to nothing. Suffering now is a pittance compared to the joys we’ll know in eternity, so why waste time and effort alleviating suffering? Why care about others or lift someone’s burdens? This life matters, but what matters more is getting into the next life. Three points in a row. And since the next life matters, there is no reason to accomplish anything great in the here and now, only to do whatever might mean reward in eternity. In the real world we can see, however, that not every person acts in this manner. They profess a belief, but continue to operate as though death were something to be avoided, suffering something to be alleviated, and life something important, not inconsequential. The conclusion is very simple: they do not believe what they profess. Let’s look at these premises and the “inevitable conclusion” about this seeming disparity. Picture the Apostle Paul sitting in a Roman jail cell, awaiting his fate. Far away, in the city of Philippi in Greece, there’s a church, one of the first places he labored. He thinks of them, and he knows they’re thinking of him. They’ve sent a representative to care for Paul, to encourage him. And that fellow will return to tell the Philippians how Paul is holding up. 20…that I will not be put to shame in anything, but that with all boldness, Christ will even now, as always, be exalted in my body, whether by life or by death. Is death to be avoided? While we believe death leads us to eternity with Christ, we also know that we were called in this life for this life. We serve a purpose, and we seek to make sure our purpose is completed before we die. Matthew 28:19-20 records Christ’s command for the church to make disciples, something we cannot do when we’re dead. Though we need not fear death, we likewise do not rush to it, because there is work to be done. In Acts 7, Stephen was able to stand boldly because of his hope in Christ. But in Acts 8, when the church is persecuted, the believers don’t line up to become martyrs. They scatter, and they continue carrying out the mission God called them to accomplish. Likewise Paul hopes to avoid death at this time so that he can do the more important work of ministry to the church, even though he freely admits that it would be great to be with Christ. There’s no contradiction here, only a balancing of priorities. Death is not to be feared, nor to be sought, while there are more important works to do. Is suffering something to be alleviated? Yes and no. Paul is suffering in jail as he writes, and he is content to continue suffering if need be. That’s his choice. Elsewhere, he tells of a “thorn” in his side that he asks God to remove. God’s response is that “my strength is sufficient in your weakness.” In other words, Paul can bear that burden. And Paul challenges us to do the same. “Each one shall bear his own load” (Galatians 6:5). And yet just above that, Paul says, “Bear one another’s burdens, and so fulfill the law of Christ,” (Gal 6:2). There’s no question. The suffering of others is the believer’s ministry responsibility. Throughout the New Testament, God’s people are commanded to minister to the suffering. James 1:27 says true religion is visiting the orphans and widows, caring for their needs. That echoes Christ’s own description of how He will separate His people from those not His in Matthew 25. Those who give water to the thirsty, clothes to the naked, food to the hungry, and company to the isolated… Those are who He calls His own. My friend pointed out verses that remind the believer that the joys of eternity outweigh the trials of this life. That thought gives me hope in hard times. But my friend is mistaken if he thinks that means we can ignore the suffering of others. He believes faith in an afterlife like that of Christianity means there is no incentive or reason to reduce the burdens of life on other men. Christ says exactly the opposite, and so does God. Suffering may be endured by the believer, but must be ministered to when seen in another, because this shows the compassion of God. Yes and no, of course. My friend points out in his thoughts on belief in the afterlife that the Christian concept of heaven makes earthly accomplishments seem meaningless. Paul is a great example, who later in this very same letter writes out a list of all his qualifications and reasons to boast. Then he says those are all worthless, like dung, when compared to the prize of knowing Christ. So yes, it seems like belief in the afterlife drives Paul to throw away care for doing anything great with this life. But that’s not the case. Instead, we see that a shift has taken place in Paul’s value system. Where before, he achieved all those special titles and trophies, now we have an apostle who repeatedly takes pride in something else: the people to whom he has ministered the love and truth of God. He writes to church after church in the New Testament, telling them of his love and his joy at their growth. They are now his prize, their maturity his treasured achievement. Does Paul go off, so heavenly focused that he’s of no earthly use? Hardly. Instead, Paul lays the foundations of theology for this off-shoot of Judaism, and through his ministry, Paul changes the course of the Western world for almost two millennia now (for good or ill, depending on how you view the faith). Knowing or believing that there’s an afterlife doesn’t exempt me from a responsibility to live this life to the fullest. Colossians 3:17 calls us to excellence in all we do. 2 Cor 5:15 and Gal 2:20 remind the believer that what we do in this life is of great importance to God. 1 Peter 3:15-17 tell us to live in such a way that anyone who says something bad about us will be ashamed. Still, we see Paul claiming that to die and be with Christ is better than this life, and elsewhere stating that he gladly gives up all his accomplishments for the greater prize of knowing God. This present life is by no means inconsequential to the Christian. But in light of the value of knowing Christ, there’s no comparison, no question of which is more important. So, is there only one ‘inevitable’ conclusion? My friend determines that most believers don’t truly live out what their faith claims, since they do think life is important, and suffering is meant to be alleviated, and death is best avoided. I think it’s pretty clear that there’s more to it than just an ignorance or failure of faith. In fact, my faith informs my thoughts quite the opposite from what my friend expects, concerning the value of life and compassion for those in need. I do believe that all of this raises some important criticisms and challenges for the church. But this response has gone on long enough, so I will save that for next time.